One of the symbols of Los Angeles might be vanishing. Sure, the palm is not native to Southern California, but since the 1880s seedlings have been imported, from 1900 on large palm nurseries sprang up everywhere. For the Olympics in 1932 the city of Los Angeles planted palm trees all over town – PR-savy they where already way back then – and since then they really have been a symbol of the city. Now these palm trees are dying – from old age and a fungal desease. 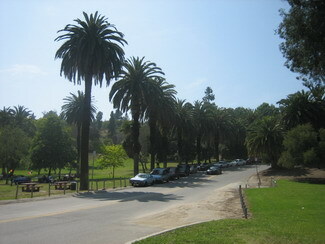 The city of Los Angeles has decided not to plant new palm trees, but to replace them with oaks and sycamores. Residents however can still buy their own palm trees and plant them on private property – which many do. So there will always be palms in Los Angeles. But there might be a lot less in the decades to come. I’m sorry to learn that the palms are dying. I absolutely love palms. There’s something so exotic about them. We don’t have many here in Central Texas, but there a lots in south Texas. I don’t know if they’re native there, but they certainly aren’t here. Well, with a life span of 80 to 90 years it was to be expected that a large number of the palms around here would slowly die. This fungal disease does not help either. The sad part is simply that the city of L.A. is not replacing the palms, thereby changing the look of the city significantly. Hello – palms & L.A. – that’s marketing, City Hall, people expect this combination. It is as L.A. as the stars on Hollywood Boulevard. Having read up on palms quite a lot, re. your remark about palms being native to Texas – apparently only two types are truly Texan: Sabal mexicanica and Sabal minor. In California the only true native palm is the California Fan Palm.